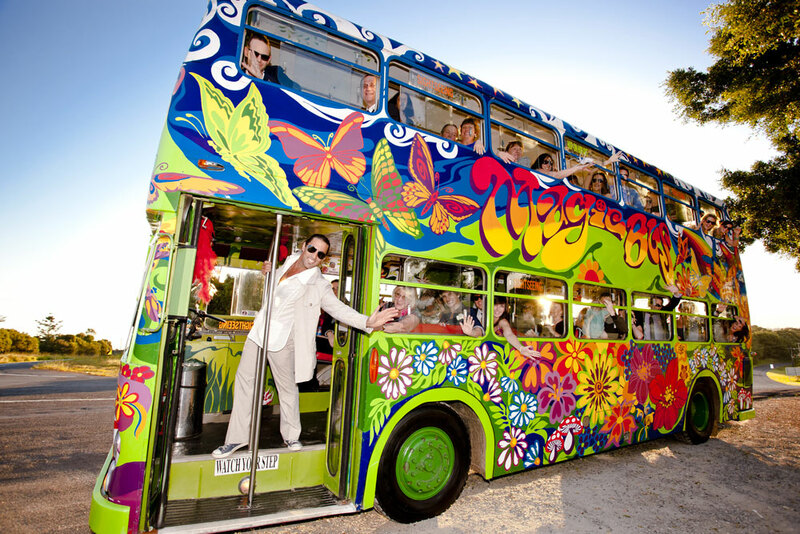 Byron Bay Double Deckers, your one stop shop in transportation. 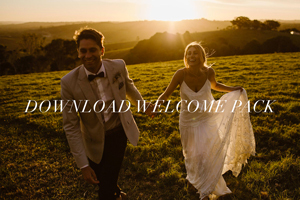 You’re going to the chapel or beautiful hinterland mansion, but how are you getting there? Well if you consider yourself unique, someone who likes to stand out from the crowd and hoping you’ll get that extra cred’ with the relos’ when their transport option turns out to be not only formality and function, but a totally wow-worthy moment. 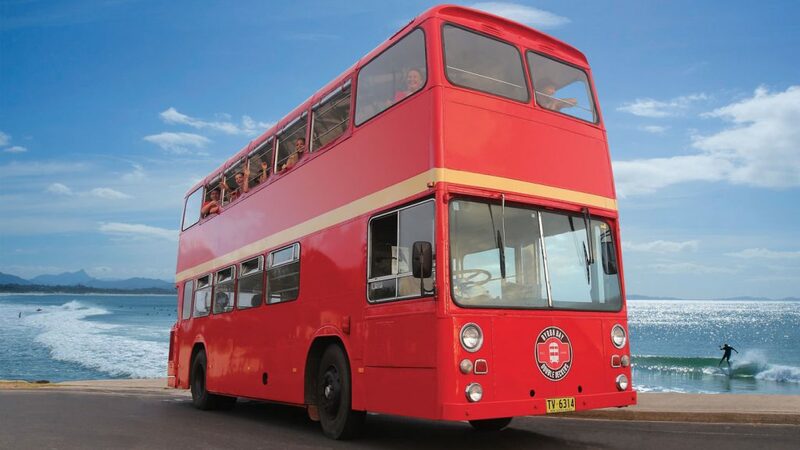 Look no further than our vintage double decker buses! 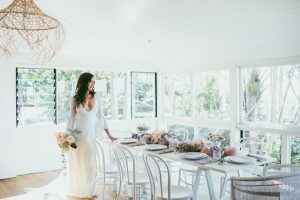 We have provided wedding transport for the Byron shire and beyond for the past 12 years, specialising in transferring wedding guests and bridal parties to the ceremony, reception and photo shoot. We are a one stop shop! When it comes to transport we are here to assist you in organising your transportation needs in any shape or form, so be rest assured your transportation is one thing you do not need to worry. 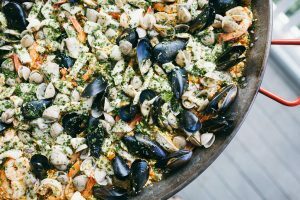 Our team can take care of everything. 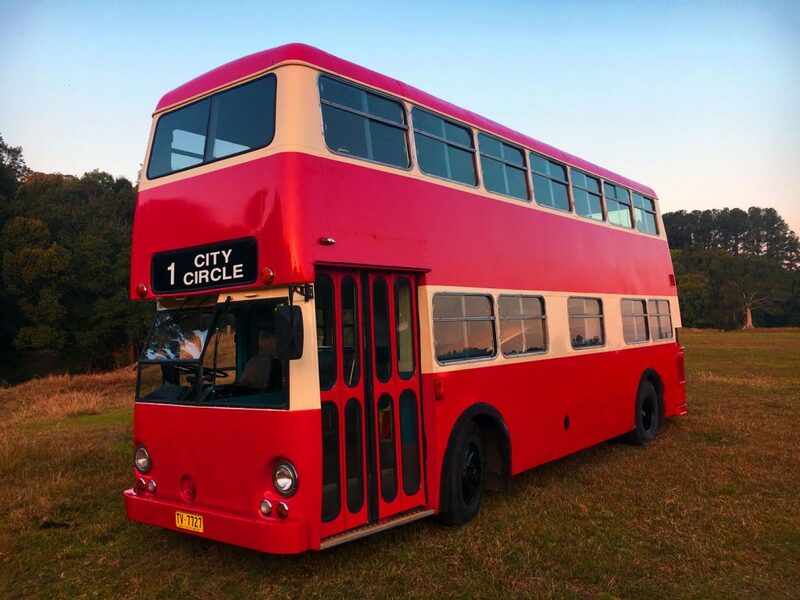 So if double deckers are not your thing, then we will find the perfect transport for your event and budget, whether that be a standard bus, shuttle bus or kombi… just ask and we will help you. We are quick to reply to enquiries, we are always on time and we go that extra mile to accommodate our client’s needs. 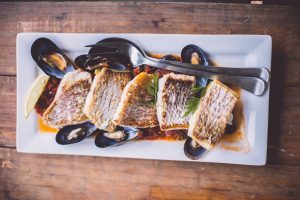 We offer much more than just transport! 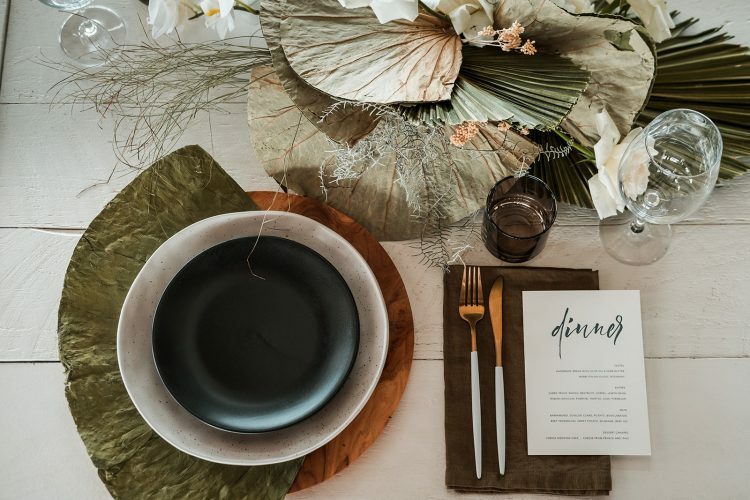 We are ‘great vibe’ creators, providing a space through colour, style, music and energy for guests to unite before even arriving at the venue. 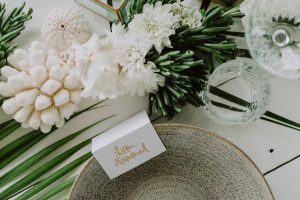 Smiles will be hard suppressed on disembarking, creating a union of love and friendship for your special ceremony ahead. 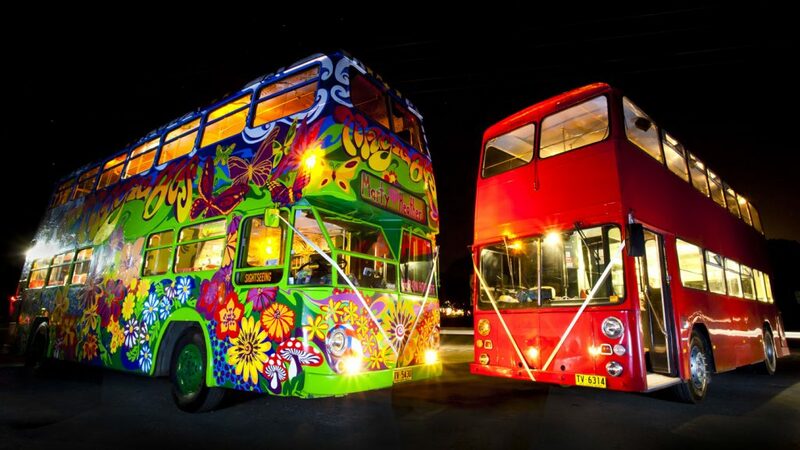 Our fleet consists of 3 beautiful double decker buses. 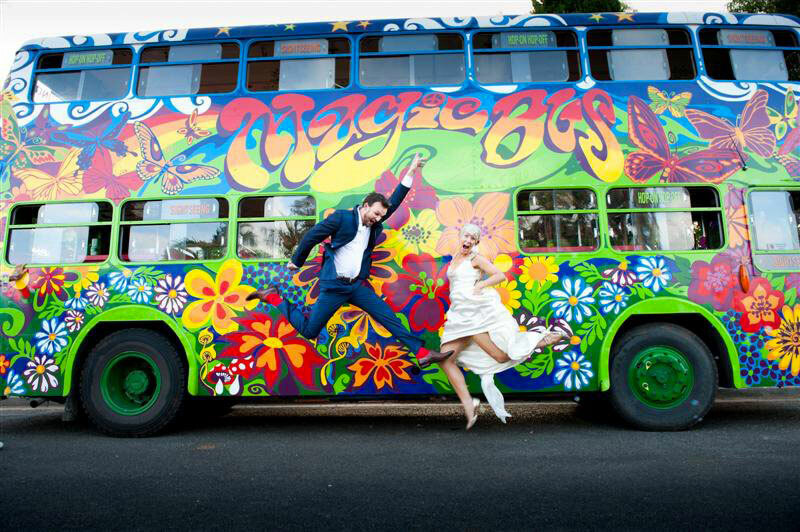 The amazing colourful Magic Bus can seat 72 passengers and our vintage Red Buses can seat 69 passengers each. However we do allow for additional passengers depending on the venue and how big the numbers are. 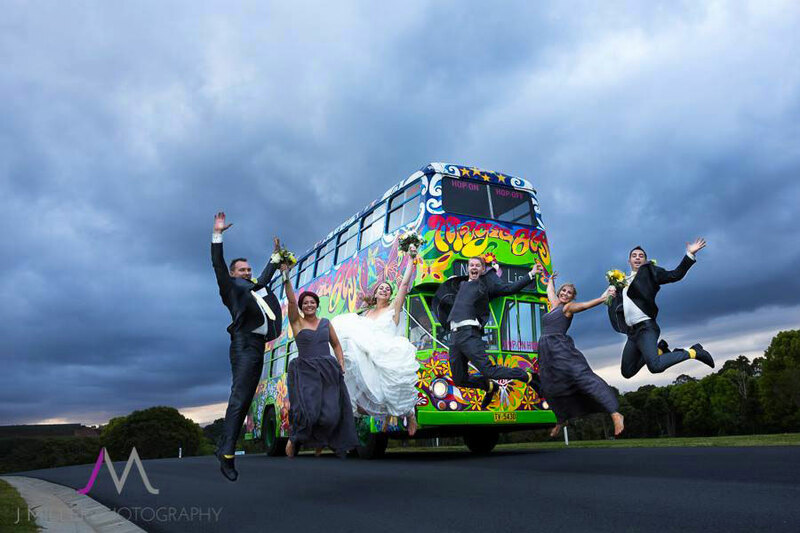 So chances are we can fit all of your wedding guests onboard in just one trip. All this seems too amazing to be true? 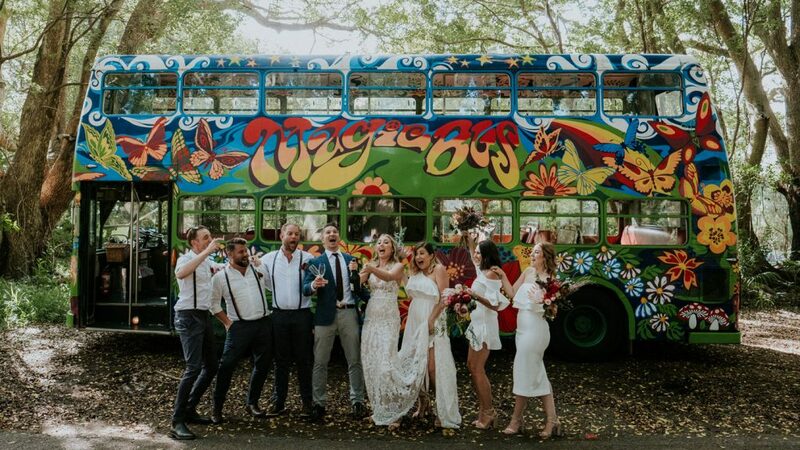 Well there’s more…Our buses are also equipped with state of the art sound systems and being the ‘vibe’ creators that we are, we have an excellent range of fun playlists, however you are welcome to compile your own music to suit the occasion and to reminisce over the union of your great love. Our driver’s dress code is original safari suits only, and personality combined with being a true gentlemen is high on the list when it comes to staff. You will see this shine through in our product and even more so when our driver hops out of his seat to offer a gentlemanly hand; nothing wrong with some old fashioned chivalry! 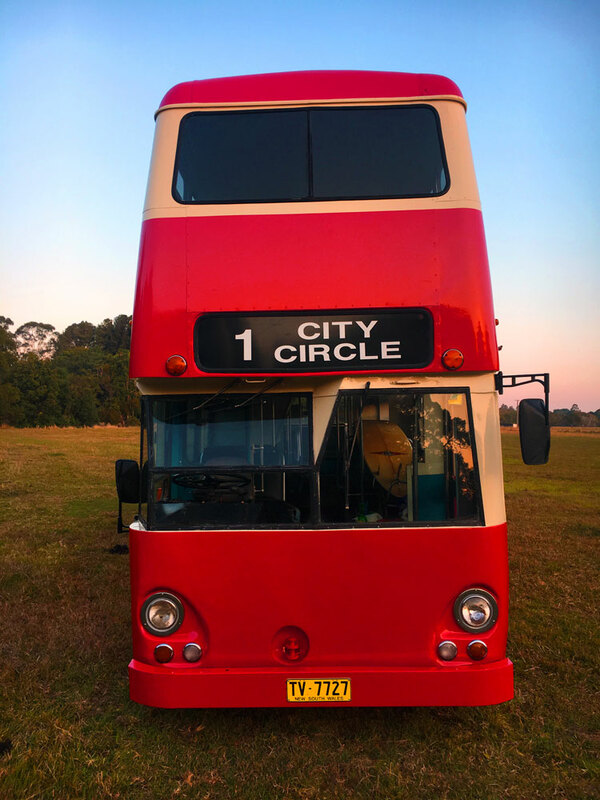 So by choosing us for your transportation needs, your Byron Bay Double Decker experience will ensure your guests have an unforgettable time – in true Byron Bay spirit! First impressions count and our buses will definitely impress!